Nestled among mountains and farmland and on the edge of Hafren Forest is Wigwam® Holidays Hafren, an absolutely stunning location for a mid-Wales break. Based on a 300-acre working farm run by Nia and Endaf Meddins, the site has six Running Water Deluxe Wigwam® Cabins (two with wood-fired hot tubs) and all come equipped with everything you need for a peaceful break. In fact, if you’re not a fan of overcrowded tourist hot spots, or fancy getting off-grid and off the beaten track, mid-Wales is the ideal place for a recharging holiday. With quiet country roads that lead right out to the west coast, winding through small towns and villages and with relatively very little traffic on them, it is quite a pleasant change from the tailbacks and queues that we often associate with holidaying in peak-season. 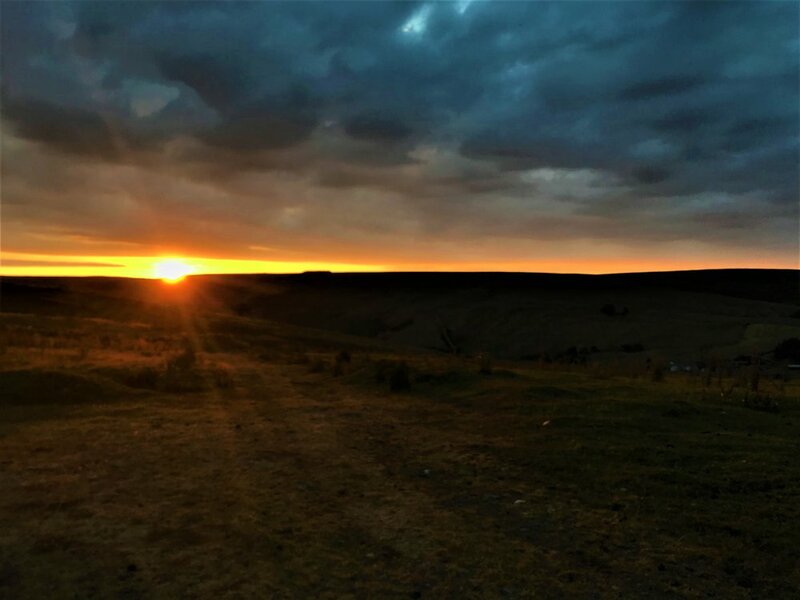 We visited Wigwam® Holidays Hafren in July, on World Cup final weekend and I took the opportunity to escape it and go on a digital-detox for a couple of days. The site has WiFi but as I had no phone signal, I chose to make the most of it and take a break. Something I never regret doing. On arrival, we were greeted by Nia and her children and shown around the Running Water Deluxe Wigwam® Cabin, which has a double bed, sofa bed, fridge, hob, cooking utensils, a tv and most importantly, an en-suite bathroom. As you may have gathered from previous posts, Nick likes his home comforts, so to have an en-suite bathroom makes my life much easier. Outside we had a decking area with a picnic table, a wood-fired barbecue and fire pit and a two-man hot tub which Nia showed us how to heat up. The cabin had views across the valley which was dotted with sheep and wind farms and stretched as far as the Hafren Forest and it has a football goal and plenty of space for a run-around if you're that way inclined. We opted to walk to the nearest pub on the first evening, which was an uphill hike through the farm and along Glyndwr's Way, a National Trail with incredible views across the Cambrian Mountains. It was about a mile-and-a-half and we were greeted at the other end by some simple home-cooked food and cold drinks at The Star Inn before walking back as the sun set. The next morning we had a lazy breakfast and drove out in search of the Hafren Forest, taking the scenic route around Llyn Clywedog and trying to spot an Osprey (without any luck). The night before, the fishermen on the table next to us in the pub had blamed the increase of the Osprey population in mid-Wales on Rutland and as Rutland migrants ourselves, we kept our heads down and giggled to ourselves. It’s a small world. From the Hafren Forest Visitor Centre, we chose a short, circular route which led to the Severn-Break-its-Neck waterfall, across wildflower meadows which had, in the not too distant past, been woodland as part were still being cleared and then back through the Forest, across the river. We only saw four other people on our walk, again making it a refreshing change from similar attractions in the north. It might have been due to the heatwave that was sweeping the nation but we enjoyed a gentle stroll back through the shaded woodlands and were glad we hadn’t chosen a longer route. Back in the car we decided the air con was our best friend and chose to take a drive out to Aberystwyth for lunch. It took us about an hour but we found it easy to park and we were soon eating chips and looking out across the Irish Sea - our first ever visit to the west coast of Wales. On the way back to the site, we stopped off once again at Llyn Clywedog to take in the view along with another couple who exclaimed: “Who needs the south of France when you can have this?” We couldn’t agree more. Once there, we fired up the barbecue and the hot tub but the wind picked up and we opted to cook inside on the hob instead, emphasising what great facilities the Wigwam® Cabins have, and sinking our weary limbs into the hot tub just as the sun went down to the sounds of farm life echoing across the valley. We drove north to Swallow Falls and had some lunch in Betws-y-coed before turning east and heading home. All in all, we had a wonderful (surprisingly sweltering) weekend in mid-Wales and were blown away by the scenery and atmosphere. Slow Tourism is all the rage at the moment and I’d argue that in Britain, you can’t get much slower than the pace of life in mid-Wales. It’s almost like stepping back in time to a time that goes at its own speed, isn’t dictated to by the urgency of the fast-paced digital world we live in and has retained its pride of place, making it a perfect break for those looking to escape for a few days.